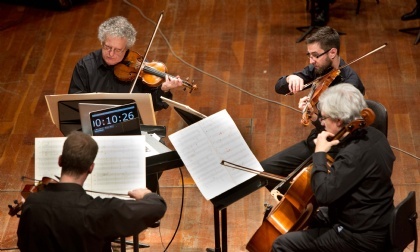 The Arditti Quartet, which is celebrating its 40th anniversary in 2014, enjoys a global reputation for its spirited and technically refined interpretations of contemporary and earlier 20th century music. Several hundred string quartets and other chamber works have been written for the ensemble since its foundation by first violinist Irvine Arditti in 1974. These works have left a permanent mark on 20th century repertoire and have given the Arditti Quart a firm place in music history. Such composers as Adès, Aperghis, Birtwistle, Cage, Carter, Dufourt, Dusapin, Fedele, Ferneyhough, Francesconi, Gubaidulina, Harvey, Hosokawa, Kagel, Kurtág, Lachenmann, Ligeti, Nancarrow, Rihm, Scelsi, Sciarrino and Stockhausen have entrusted the world premieres of their music to it, and the quartet’s repertoire comprises all string quartets of many of the above and other composers. The ensemble believes that close collaboration with composers is vital to the process of interpreting modern music and therefore attempts to collaborate with every composer whose works it plays. Teaching for many years at the Darmstadt Summer Courses for New Music, the players have given numerous master classes and workshops for young performers and composers all over the world. The Arditti Quartet’s extensive discography now comprises well over 200 CDs. Renowned for recording many composers’ works in their presence, the quartet recorded the complete quartets of Luciano Berio shortly before his death. Among the latest releases one should mention its recording of Stockhausen’s spectacular Helicopter Quartet. Over the past 40 years, the ensemble has received many prizes for its work. It has won the Deutscher Schallplatten Preis several times and the Gramophone Award for the best recording of contemporary music in 1999 (Elliott Carter) and 2002 (Harrison Birtwistle). The prestigious Ernst von Siemens Music Prize was awarded to it in 1999 for lifetime achievement in music, setting the quartet on a par with other winners such as Berio, Britten, Carter, Ferneyhough, Lachenmann, Ligeti and Rihm, whose works have been performed by the quartet. To celebrate the Quartet’s 40th anniversary, special events took place in the Barbican in London and at the Witten New Music Days in Germany in March, April and May 2014. Several composers wrote tribute works for these occasions as did several more throughout the year. Zeynep Gedzlioglu’s music is an emphatic plea for the value of heterogeneous and individual difference.